Mass transit is often—and often rightfully—conflated with public transit. But in reality, the open-to-everyone variety is a subset of mass transit. It’s a fact that’s well-known to select San Franciscans—those who work in Silicon Valley. Every morning and evening, private buses criss-cross the city, hauling these commuters to and from their jobs. It’s a shadow transit network that, despite operating in plain sight, isn’t public knowledge. Or at least wasn’t. 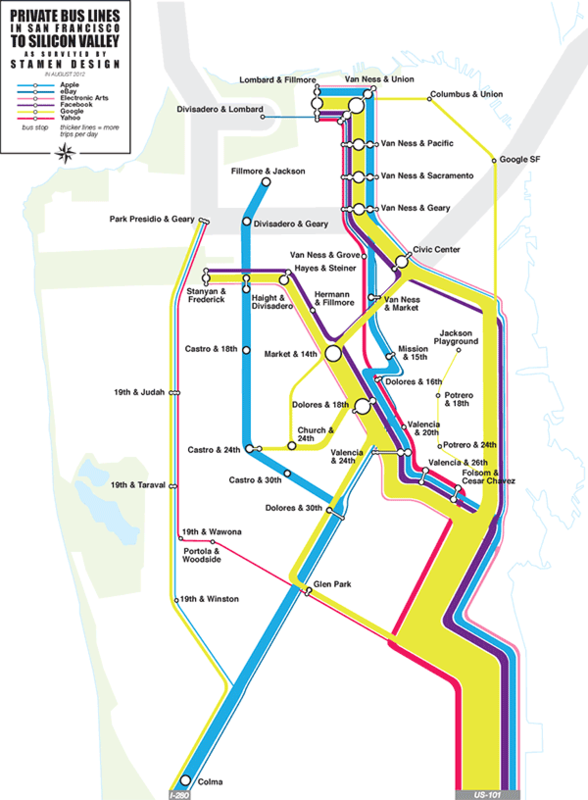 Stamen Maps used data from Foursquare and bus companies to plot the routes in the style of a traditional transit map. Now you can see where the Google bus picks up. Just don’t expect to hop onboard with $2 and some change.